Help, how to topics > Print reports > How to print a circulation history report grouped by item? How to print a circulation history report grouped by item? Manage Loans displays a history of all circulation transactions. Each transaction is linked to a library patron and library item information. 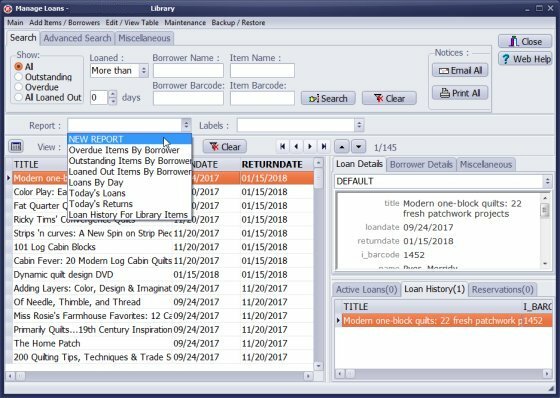 You can create many library circulation reports. This topic explains how to create a library circulation history report. The report will list item information followed by the loan transaction history in a table form. Click New Report in the Report box. 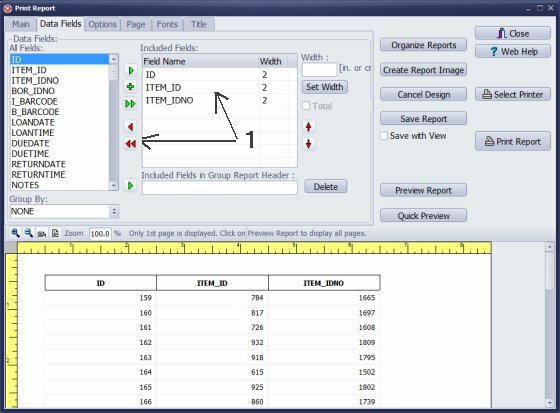 Print Reports starts with 3 preselected data fields and a simple table layout. We don't need the preselected data fields. Click the Double Red Arrow (1) icon to remove the unwanted data fields from the Included Fields box. Select I_BARCODE (item barcode) in the Group By (1) box: all circulation transactions for the same item will be displayed together (grouped). Define header: select TITLE in the All Fields box and click the Green Arrow icon to include the field in the Group Header (2). Repeat procedure with AUTHOR and I_BARCODE data fields. Scroll down and up in the All Fields box and select the following data fields: NAME (patron name), B_BARCODE (patron barcode), LAONDATE (date when item was loaned out), RETURNDATE (item return date). When data field name is selected in the All Fields box click the Green Arrow icon to include it in the Included Fields box. 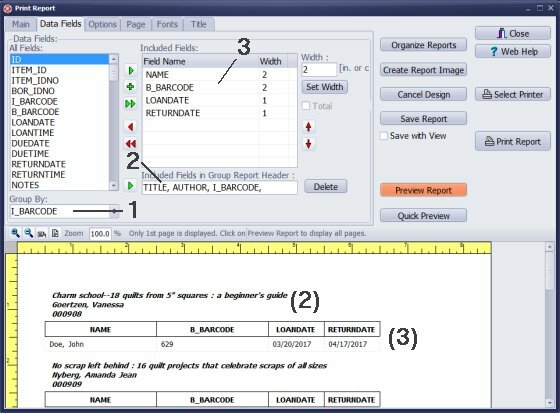 Click Quick Preview, Preview Report, or Print Report. Group header contains: item title, item author, and item barcode. 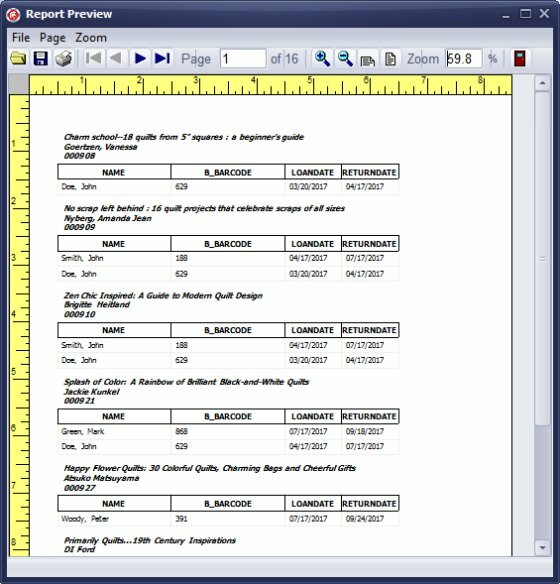 Item's circulation history table contains: patron name, patron barcode, loan data, and return data.